Combine flour, salt and baking powder. Add oil and water and mix until smooth. Add a bit more water until dumplings are soft and not at all dry. 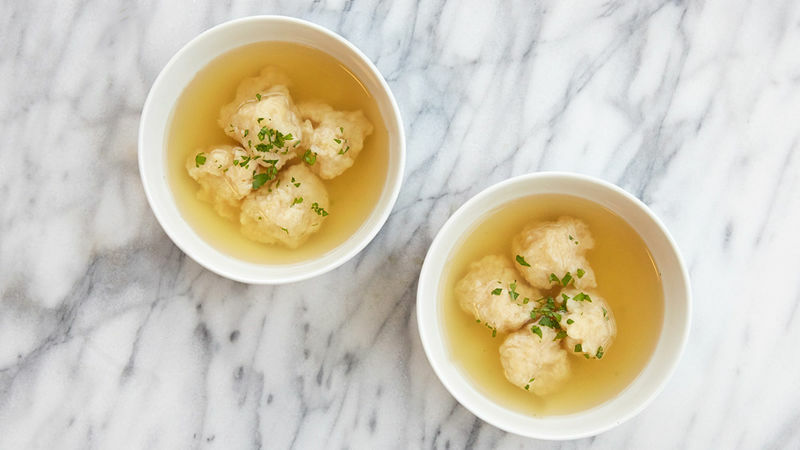 Serve dumplings in broth garnished with chopped parsley or chives as desired. If you have a few minutes and a few ingredients, these dumplings can be yours. All yours. Soup season is here whether we're ready or not. And if you're not quite there yet, we've got the easiest suggestion yet for easing into the season: Make dumplings! So easy. So quick. So very, very delish. Mix up flour, salt, baking powder, oil and water. You counted right. 5 simple things right outta your kitchen cabinet. Heat up some broth or your fave soup to a boil. Scoop up a wad of that dough, about like this. It's all gloppy and dough-like, and that's a-ok.
Plop those dumplings into boiling broth. Let them cook for a few minutes. And that is how you get into the season the RIGHT way. The EASY way. The TASTY way. Can't beat it!